The aim of the graduate program in chemistry is to provide an environment for individuals to develop the skills to become leaders in scientific research and education, capable of making original contributions to the advancement of chemistry and related disciplines. Programs leading to the M.S. and Ph.D. degrees are offered in analytical chemistry, biochemistry, chemical education, inorganic chemistry, organic chemistry and physical chemistry. Research in the department is conducted in such interdisciplinary areas as bioanalytical, bioorganic, bioinorganic chemistry, chemical biology, materials chemistry, physical organic chemistry, organometallic chemistry, and chemical physics. The graduate program in Analytical Chemistry is ranked first in the nation by US News. Few formal courses are required for the Ph.D. degree. The purpose of advanced course work is to build on the foundation gained in undergraduate study to give additional depth in specialty areas of interest to individual students. Students select courses that will equip them for research of high quality, broaden their general background, and aid them in preparing for doctoral exams. The Graduate Program in Chemistry currently has over 300 graduate students enrolled of which 90 percent are pursuing the Ph.D. degree. We are very proud of the fact that ca.72% of those students entering the Ph.D. program at Purdue will receive their Ph.D. degree. 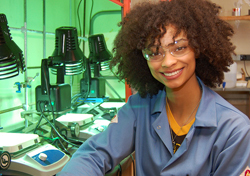 Graduate students in Chemistry typically receive financial aid throughout their graduate study (including summers) in the form of graduate teaching assistantships, graduate fellowships or research appointments. Graduate teaching assistantships generally involve laboratory and recitation instruction in sections of no more than 24 students each. Both graduate fellowships and research appointments allow students to devote full-time efforts towards their degree program. As a service to students at Purdue the University Center for Career Opportunities, in conjunction with the Chemistry Department, administers on campus job interviews for Ph.D. and M.S. graduates by industrial companies and government laboratories. This service is extremely popular with employers because of Purdue's superb facilities and the quality of its graduates. During the 1998-99 academic year nearly 700 employing organizations visited Purdue to recruit B.S., M.S. and Ph.D. graduates. The department has appointed a liaison to interface between students, the placement service and companies. All interviewing students are notified of relevant job openings through this process. We are proud to say that nearly all our Ph.D. graduate students find employment opportunities prior to graduation. For the latest graduate opportunities, our current graduate students can visit our GO! page.